In my last post I relayed how shooting one of my .45 ACP 1911 Commanders had been painful due to some arthritis issues with my hands. That was a disappointing, though not surprising, discovery for me and one that I hope and pray will help me to have more concern and compassion for students in our classes who find certain guns or calibers difficult to shoot. I love those Commanders and in fact had recently added another to the collection, one that I was modifying and had not yet had a chance to shoot. 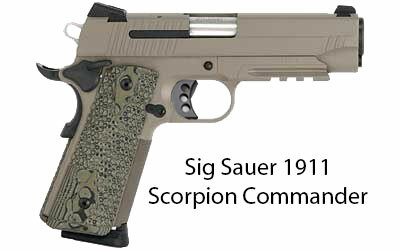 That gun is a Sig Sauer 1911 Scorpion Commander. I didn’t like the straight trigger it came with so ordered a curved, skeleton trigger from Wilson and did my first trigger installation on a 1911. Once I got it back together I needed to shoot it both to check my trigger job and the overall reliability of the gun before adding it to my carry collection. I took the Sig to the range along with a .45 Caliber Smith and Wesson M&P and a 9mm M&P. I started with the Sig and discovered I’d not done the job correctly –and the gun wouldn’t fire. Not at all. I should have figured that out at home by trying the pencil-down-the barrel test, but I didn’t. It was obvious the Sig had not been reassembled correctly. Somehow the Series 80 trigger safety disconnect wasn’t in the right position. So as not to waste the time at the range, I shot the .45 ACP M&P. It’s recoil has never affected me before, but this time, I found it a bit uncomfortable. And I didn’t shoot tight groups with the gun like I have been doing with the 1911s. I tried the 9mm M&P. That was sixteen rounds of pure shooting pleasure, all grouped together in a tight little ragged hole in the center of the target. It was like shooting a .22. Okay, maybe I’m going to have to resign myself to carrying a 9mm until I figure this all out. I fired several magazines worth of Hornady Critical Defense and Winchester Silver Tip 9mm just for fun. A week went by with me carrying the 9mm, while trying various grips on my carry Commanders to help lessen the hand pain next time I go shooting. I also went back through the YouTube Video on how to reassemble a Series 80 1911 and this time I managed to get everything on the Sig Scorpion back in the right place. The pencil I placed in the barrel went flying across the room when I pulled the trigger. It was time to go back to the range. I only took two guns to shoot this time. One was the M&P .45 because if I can’t carry and shoot a 1911 well, this would be the gun I’d want to rely on. The other was the Sig Sauer 1911. I shot the Sig first. Then I shot it again. I loaded up and shot 9 rounds of Hornady Critical Defense using the 8-round magazine that came with the gun. The gun performed flawlessly and I didn’t do so bad myself. Next, I loaded up an 8-round Wilson Combat magazine and got the same results. Then a 7-round Wilson Combat magazine. Then I shot a bunch of Winchester 230 grain ball ammo and some Winchester JHPs and some Federal Guard Dog ammo, then some more Hornady Critical Defense. What can I say? My hands didn’t hurt, the gun is accurate and reliable and promises to be one that will stand up to daily wear very well. So that’s what I’m carrying now. I’m not sure what the future will bring regarding adjustments due to arthritis in the hand, but I know it’s a possibility and I’m prepared to do whatever I need to in order to have personal and family protection with me whenever I go out.